Nutfusion gathers in nature’s finest ingredients to create Australia’s most flavoursome foods. 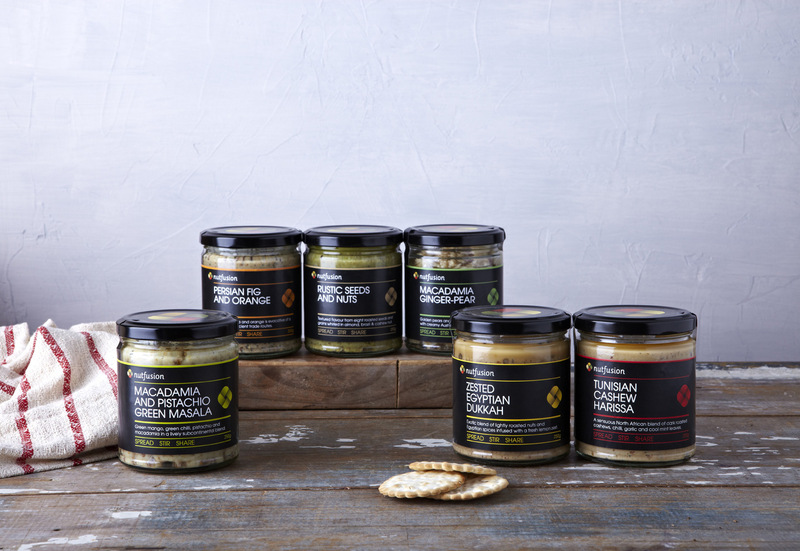 Made in small batches in Castlemaine, Victoria, our products are unique and versatile — a rewarding indulgence for food lovers with good taste everywhere. A sensuous North African blend of dark roasted cashews, chilli, garlic and cool mint leaves. Green mango, green chilli, pistachio and macadamia in a lively subcontinental blend. An exotic blend of lightly roasted nuts and Egyptian spices infused with a fresh lemon zest. Our versatile family favourite combines light, sweet and mellow flavours, a delicious everyday essential. Golden pears and dark glacé ginger blended with velvety Australian macadamias. Natural and nutritious Australian almonds with warm hearty flavours. Dried figs, macadamias and orange will take you on an evocotive journey over the Silk Road. An earthy flavour of roasted macadamias finishing with a spicy warm tingle of glacé ginger syrup. Almonds, brazil nuts and cashews mashed in a textural whirlwind of roasted seeds. Fragrant spices weave their way through a combination of fresh Australian almonds and creamy pears.